I just steeped the ground grains for 30 minutes in the water, tossed in the DME, boiled for 60 minutes, and then I let it ferment completely. OG: 1.060, FG:1.020. Once the beer was done fermenting, I bought 6 x 14.5 oz cans of pie cherries packed in water from the supermarket. I can not get fresh sour cherries here in Maine, or I would have done that, so this was the best I could do. To remedy this evil, I have actually planted 3 sour cherry trees in my yard, but it is likely that this summer will be my first decent crop. Anyway, I just poured the cherries, water and all, into a cleaned, sanitized fermenter, and racked the stout on top of this. Of course, this refermented with the sugar in the cherries. Once this was done, after 3 weeks, I bottled the beer. 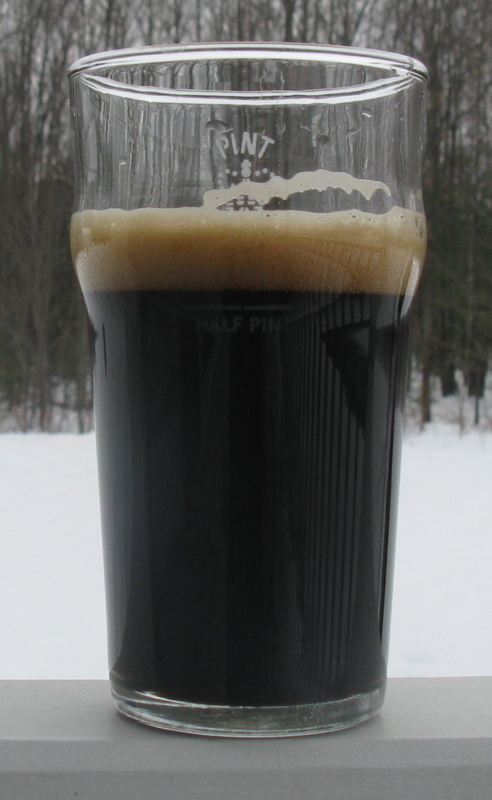 Tasting: The beer is black, with a tan colored head. The aroma is a roasty/coffee with some cherry in the background. It is pretty subdued. The beer has a mild roasted flavor, with some acidity. The cherry taste is on the background, finishing slightly tart and dry. It is very clean, but is actually a bit insipid for a stout. It has a smooth, medium to light mouthfeel. This beer goes down pretty easy and clean, and is not chewy at all, definitely more in the dry stout style. Critique: Ok. It is good and easy to drink, but there is quite a bit of room for improvement. The cherries are really not that strong, more of a background note. Part of this is this beer is over a year old now, but it did not have much cherry when it was younger. Also, using real fruit tends to give you much more of a subdued nose then using extracts. <warning, diatribe> I really have not had many beers that do well with flavor extracts, so often the aroma is overpowering and artificial, and the beer gets lost. They do work better in darker/richer beers that can stand up to the flavors of the extracts, but even then I have found them out of place and kind of fake, like soda flavors/aromas, and have avoided using them. <diatribe over>. I would definitely up the cherries if I brewed this again, probably using 10 cans of cherries, or better yet, 8+ pounds of fresh fruit with the pits intact. I think I could have left them on the fruit longer, but the canned cherries are already falling apart and have imparted much of their flavor to the water in which they were packed. I did not strain the cherries out because so much of the flavor was already leached out of them. If I was using fresh fruit, this would have aged for several months on the cherries. It is likely that part of the problem with the beer being a little thin and flat was the extra water in which the cherries were packed. I did try some of the cherries out of the secondary, and they had no flavor left, so I am not sure I would have gotten much more out of them then I did. I intended for the cherries to be in more of a balance with the malt, I was not looking for overpowering, but I think upping this a bit would bring the cherry around without being out of balance. As far as base beer goes, what strikes me is the dullness of it. In the future, I would probably drop the chocolate malt, go to 1 full pound of roasted barely, and up both the crystal and the black patent. Also, if I was using canned cherries again, I would have brewed a much bigger base beer to account for the dilution from the water in the cherries. A bit more sweetness and body would have helped turn this into a really good beer, as would more roasted flavor. I really enjoy the drying/tart finish the cherries give the beer, but it would have been even nicer combined with a stronger roasted/coffee note. Will do, have about a dozen left.